Envy a Photo? : Travel, Magic, and the letter "S." A 3-Part Blog. Part 1. Travel, Magic, and the letter "S." A 3-Part Blog. Part 1. Blue Moon: Antelope Island, Salt Lake, Utah. Seeing as how I only post to this blog once in a blue moon, I feel it's fitting that August is a blue moon month. To celebrate the celestial occasion, I am offering 50% off all of print purchases through the end of the month. Just go to my printshop and at checkout enter the code: BlueMoon. I feel, in a way, as though I should apologize for the infrequent blog posts... but conversely, I don't want to just blog for blog's sake. My goal with this blog is to provide useful photo tips, inspiring and/or humorous anecdotes, and to share my images. I became a much better photographer because of the myriad bits of free information provided by other photographers (such as David Ziser, Trey Ratcliff, Scott Kelby, etc. ), and I, too, want to share with others what I have come to understand through experienced practice and application. That being said... what a time I've had over the past few months! I performed in Opera Las Vegas' production of Don Giovanni as the Commendatore with Metropolitan Opera Musical Director Greg Buchalter, Metropolitan Opera Stage Director Jonathon Loy, and Met singers Philip Horst (Leporello), Jeff Mattsey (Don Giovanni), Amy Shoremount-Obra (Donna Anna), Luana DeVol (Donna Elvira), and Mark Thomsen (Don Ottavio). I performed with the Palm Springs Opera Guild's outreach project, where I was able to sing for hundreds of elementary and middle school children each day for two weeks. I passed all of my master's courses at UNLV with flying colors. And on my birthday I sang a well-attended recital followed by a very successful art show. Most recently I spent a month in Hawaii singing with the Hawaii Performing Arts Festival on the Big Island, where I performed as Sarastro in Die Zauberflöte, in addition to singing in concerts and cantatas. I just got back to the mainland a couple of days ago, and brought back about 200GB of images just waiting to be processed! My rule when I fly is to never check my camera. However, when I flew to Hawaii I had so much luggage (my computer, music scores, performance clothes, hiking clothes, portable portrait studio, guitar...), I had to make the hard choice to check my camera in lieu of carrying on my music scores and guitar. Well, Murphey's Law prevailed, and my flight was delayed leaving Las Vegas, which put me into LA at the moment my connecting flight left for Kona. I had to take a different flight to Honolulu, where I was put up for the night, and then fly from Honolulu to Kona the next morning. When I arrived in Kona, my bags did not! Worse, when the customer service agent re-booked my flight out of LA, they took my baggage claim stickers, so there was no way for the people in Kona to track my bags and let me know when they would arrive! 30-seconds at f2.8 ISO 800.
camera to get a sharp image. Hilo was rainy and cloudy when I arrived, but that, to me, wasn't a bummer. The sky was lit up a beautiful orange and purple from the reflected street light. I decided to take advantage of this opportunity to capture Rainbow Falls in a different light than I've ever seen; every photo I've ever seen of Rainbow Falls is a daytime photo. Normally, if the sun isn't obscured by clouds, the spray from the falls creates a rainbow during the morning. The Hawaiian word for rainbow is Anuenue, which, to me, is a much more beautiful and appropriate term for the beautiful band of refracted light. 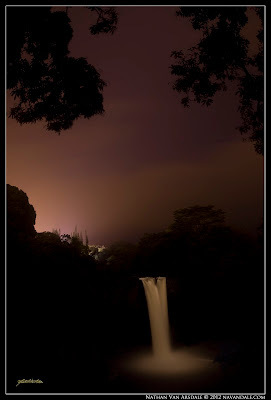 So, I arrived in Hilo around 1:00, pulled into the empty parking lot, walked the twenty-or-so steps to the falls lookout, and accompanied by a few curious ferrel cats I captured the falls. It took a few tries to balance the light of the sky with the falls, and I eventually ended up "painting" the falls with my headlamp. My original plan was to find somewhere nearby to camp until dawn, at which point I would then photograph the waterfall with its morning rainbow, but it was raining so hard that I decided, instead, to head down to Volcano National Park to get some night photos of Kilawea. 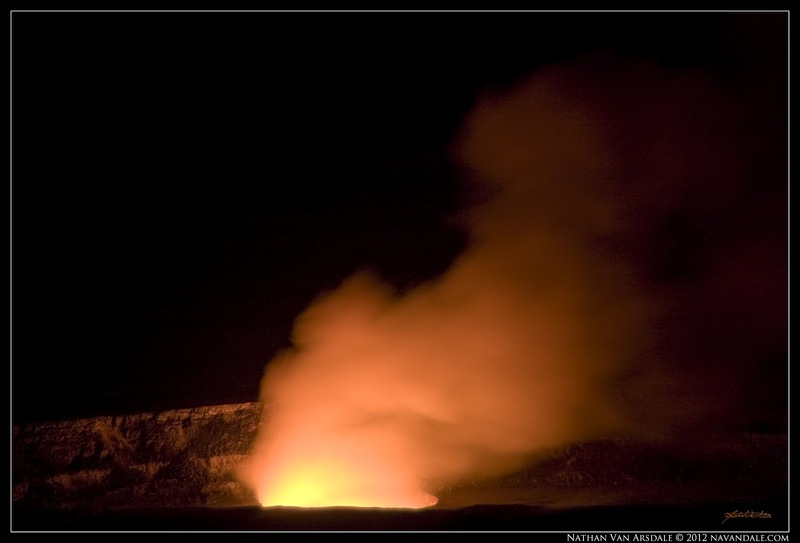 Halema'uma'u Crater: Volcano National Park, Hawaii. Obviously, when capturing images at night, there is not a lot of light. If you should use a tripod during normal landscape photography, you should DEFINITELY be using a tripod for night-photography. Seems logical enough, but I actually know people who have tried capturing star-trails by placing their camera on a picnic table and holding their shutter button with their finger. First of all, that would get really boring, really fast. But secondly, there is no way you can compose a sharp image that way. So ALWAYS, ALWAYS, ALWAYS use a tripod... otherwise, why even try? 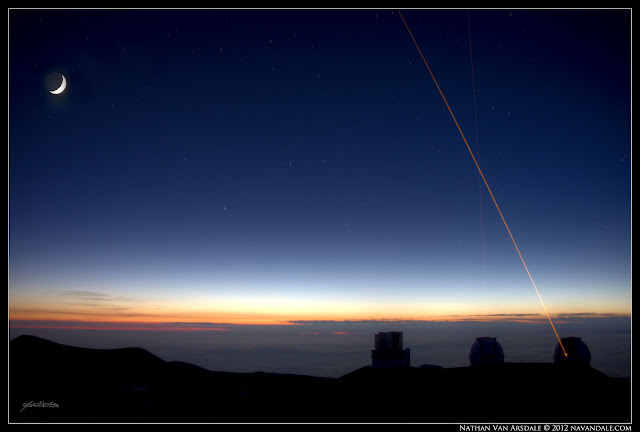 Observatories at Mauna Kea use lasers to target distant stars during twilight. Calculating a proper exposure can be tricky depending on the phase of the moon, your altitude, the amount of atmosphere, etc. Most newer DSLRs can photograph at a pretty high ISO without a lot of noise. I don't have one of those cameras. My 40D gets pretty noisy at ISO 1600. 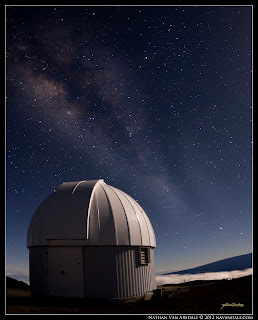 Typically, if I want to photograph the milky-way, or any other night scene that doesn't involve star-trails, I shoot at ISO 800, f2.8 at 30 seconds. With a 5D Mark II I could easily shoot at ISO 3200 for 30 seconds and get a much more defined Milky Way... so know your camera's sensor and shoot accordingly. When photographing man-made light sources at night (cities, buildings, campfires, etc. ), normally I have to quicken my shutter speed so that I avoid too many blown-out areas. When photographing star trails, you have the choice of using your shutter-release cable and shooting a really long exposure, or shooting multiple 30-second exposures that you can later blend in photoshop for ultra-sharp trails. I actually prefer the lighter sky that I get with a ten-minute, or so, exposure. When shooting star trails, I dial the ISO back to about 200, and using my handy-dandy exposure calculator app on my droid, I can easily figure out how long to set the exposure at the lower ISO. The image above is actually an HDR image created from 3-RAW images. I wanted to show how clear the moon was, while still seeing the cool details of the sky and catch-light on the observatories. You'll notice that since it's a combination of 3-images over the course of 50 seconds (30s, 15s, 4s) at ISO 100, that the final HDR image actually shows small star trails. 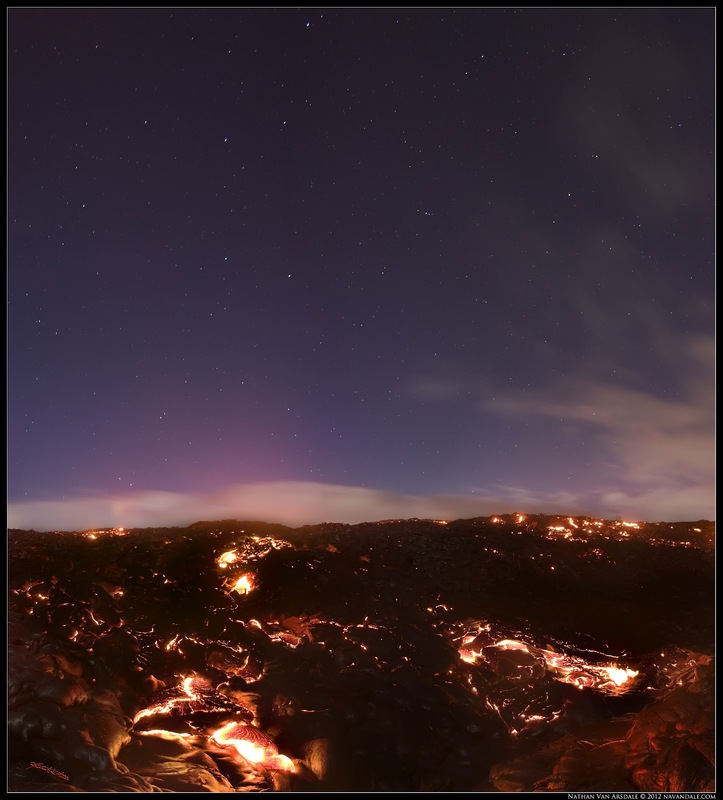 Pu'u O'o lava flow on the Big Island of Hawaii. Focus can also be tricky with night images. Autofocus will not work! Therefore you have the choice of either setting your focus manually to infinity for a really sharp sky, or even better, using a light to illuminate a foreground object long enough to bring it into focus. 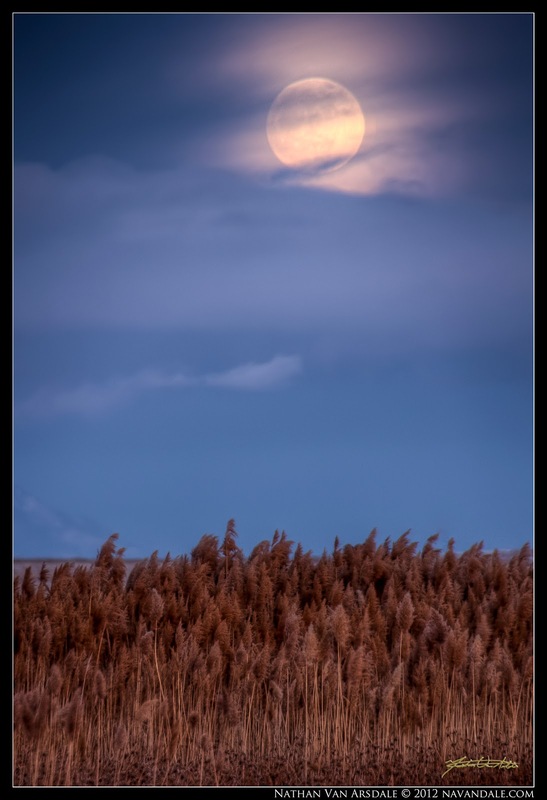 If there is any moonlight, the camera will expose the foreground and create a really stunning night photograph (nothing is worse than an out of focus foreground). The above image of the Pu'u O'o lava flow provided enough light on the foreground that I was able to easily focus on the edge of glowing lava where it meets the dark rock without the need of a headlamp or other light. This is actually a panoramic image merged from 4-images, two for the foreground, and two for the sky. Obviously, like when photographing a campfire and night sky, the fire is MUCH brighter than the stars. While taking these photos I experimented with a technique called "black cloth," wherein I covered part of the image with a piece of dark material for most of the exposure, allowing for a balanced exposure (in this case, I covered the lower part of the image containing the lava, that way the ground wouldn't be too bright). I hope you found these tips useful... and if any were confusing, I cover everything I talked about in greater detail in previous posts, so feel free to explore my blog. Make sure to check out Part 2 of Travel, Magic, and the letter "S," where I talk about magic. Travel, Magic, and the "S" Curve, Part 3.